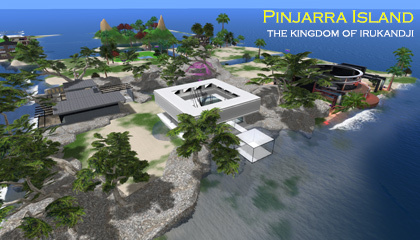 NOTE: This page is about Pinjarra Island in InWorldz. 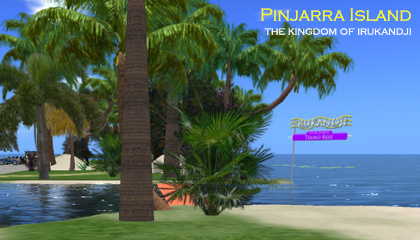 The Second Life version is here: Pinjarra Island in Second Life. 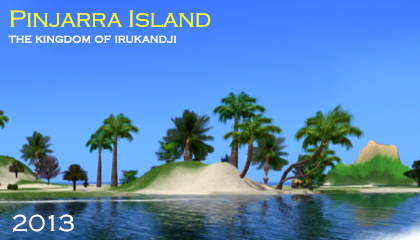 Pinjarra Island is a residential region in Tamita State in central Irukandji. 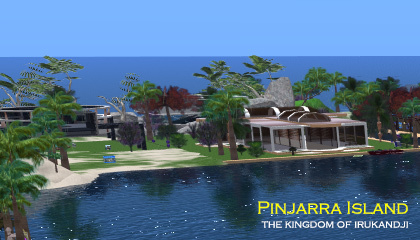 The second incarnation of Pinjarra Island, this version in InWorldz respects the location and culture of the original in Second Life. 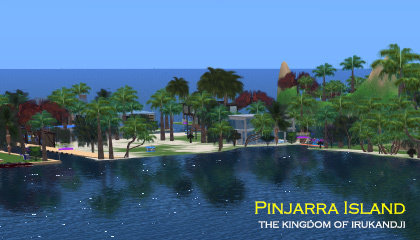 Located due southwest of Irukandji's capital, Tamita Island, the landscape and layout of Pinjarra Island is loosely based on the old version. 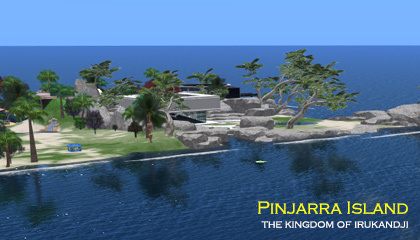 The Aboyo River passes through Pinjarra Island, from Tiamo Reef in the east to Tamita Bay (later Adonis Lagoon) in the north. 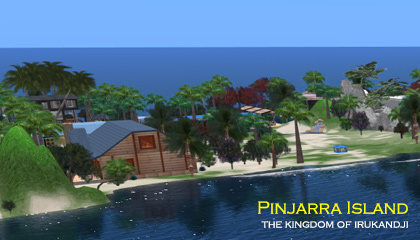 The L-shaped river design allowed for better parcels along the beaches than last time, and worked very well. 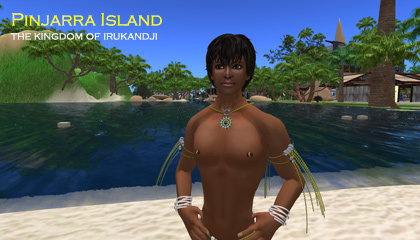 I would later use the same river setup on the Manatu Island and Toraboyo Beach regions. 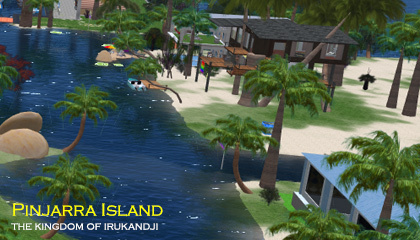 Pinjarra Island was well received and proved popular with new landowners coming to Irukandji. 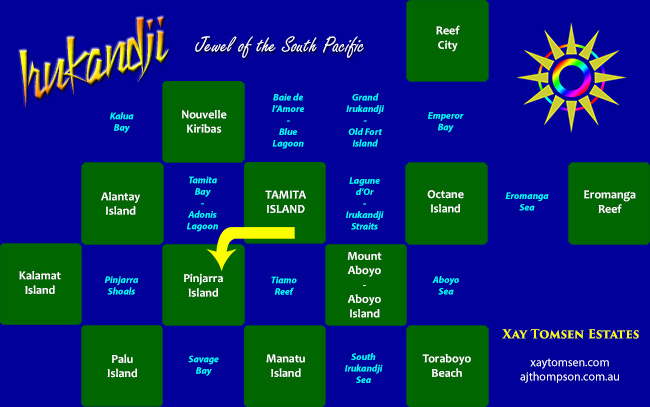 Regions adjoining Pinjarra Island, clockwise from west, were Pinjarra Shoals, Alantay Island, Tamita Bay (later Adonis Lagoon), Tamita Island, Tiamo Reef, Manatu Island, Savage Bay, and Palu Island. 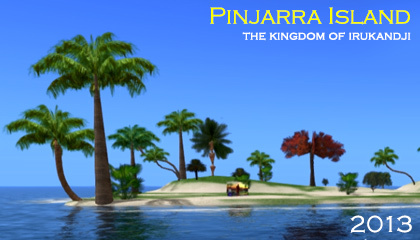 Below is a gallery of photographs of Pinjarra Island.